Late this morning, I packed a little spade, a plastic bag and my Husband and headed for the woods. Last week was so incredibly busy, that I didn't have time to go pluck a few of the hundreds of ramps I spotted the week before. It's been rainy here for the past 3 days, and the forest floor felt spongy. I felt grateful to shovel up the the dark earth carefully surrounding a few of the ramps; I felt strange to be digging in a common area, the ground foreign and surprisingly healthy - fresh with that loamy, dirty smell that before today I thought only really existed in the country. I brought home my haul, which was on the light side because Spring is fading and I was cautious not to over dig. 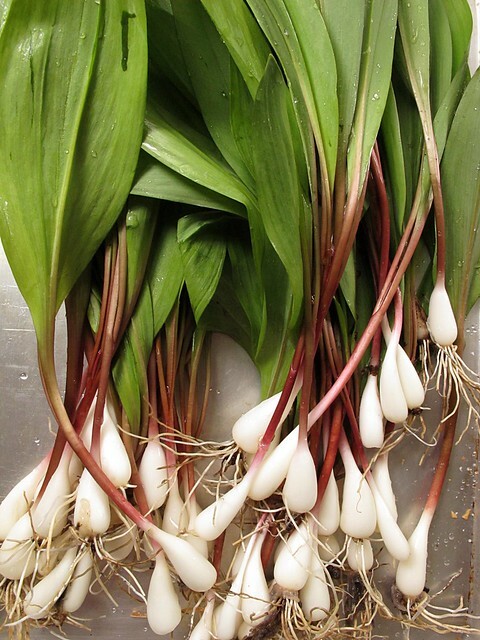 I'm not sure I can ever get over the prettiness of ramps, their ribbony tops and rose-legged midsections, their gleaming white bulbs that smell cleanly pungent. 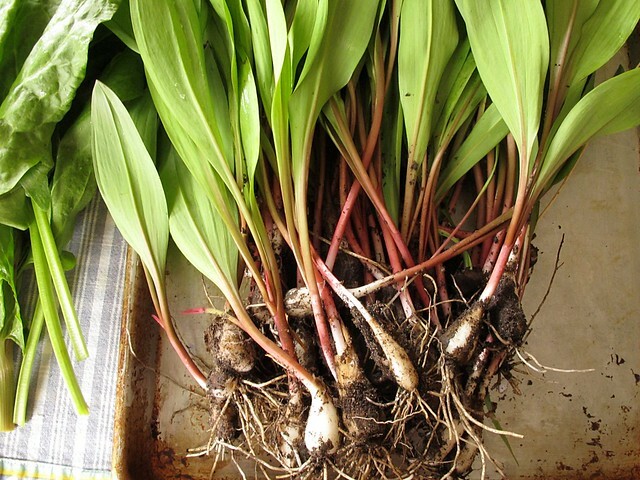 This is the first time I've ever foraged for ramps, and I didn't really go out in the woods this Spring looking for them. But there they were, laughing at me that I had just bought a little bunch at the store for $2.50, hiding in plain sight amongst the trilliums and Jack-in-the-Pulpits and other tiny, flowering Spring things that I recognized and pointed out to my family. When I saw the bounty of the forest just steps from my house, I vowed that I would experiment a little more with this wild leek and today I did. My neighbor across the street planted some things in the back of her house a few years ago in a garden plot that ended up being too shady to be prolific. The chives I could recognize, but I didn't recognize the large, neat green bunches of sorrel that seemed to be self-propagating themselves. Neither of us knew what it was (since she had forgotten what she planted), and as we nibbled it, tart and lemony, she found the original plant marker buried beside the largest clump. 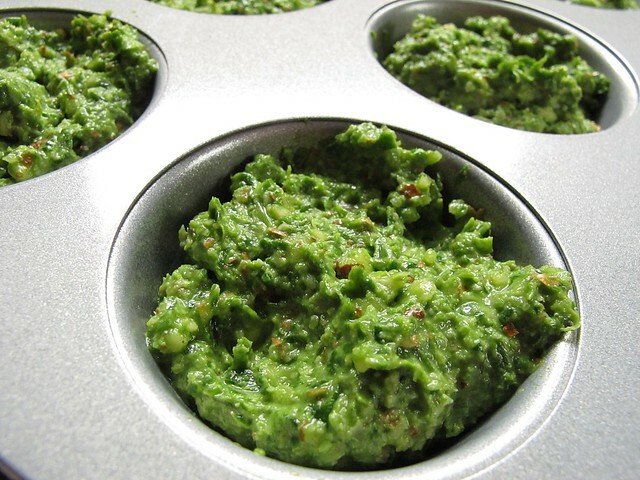 Having the memory I do, I recalled seeing a sorrel-ramp pesto recipe - and after I mixed up a double batch of it today, I think I can declare it my favorite pesto ever. I love when I taste something and it exceeds my expectations. Sorrel on its own, munched in the outdoors, is good and shockingly refreshing, but I couldn't imagine using an amount of it in a recipe and not having it take over. 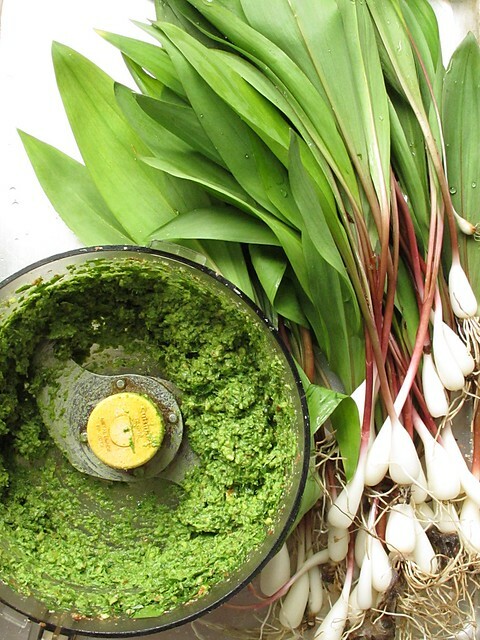 But ramps and sorrel are a perfect match, complementing each other perfectly and not really overwhelming me with their combined strength. I did just as Annie suggested and portioned it into mini-muffin tins and popped it into the freezer. It seems a shame to freeze something so delicious mere moments after it was out growing in the woods, but I maybe will get back out to pick just enough more for another fresh batch before the season ends. I trimmed the bulbs from the rest of my stock and weighed them in at about 10 ounces. Not quite enough for much, but enough for about half of Hank Shaw's gorgeous looking saffron pickled ramps. I settled on that one after much debate. 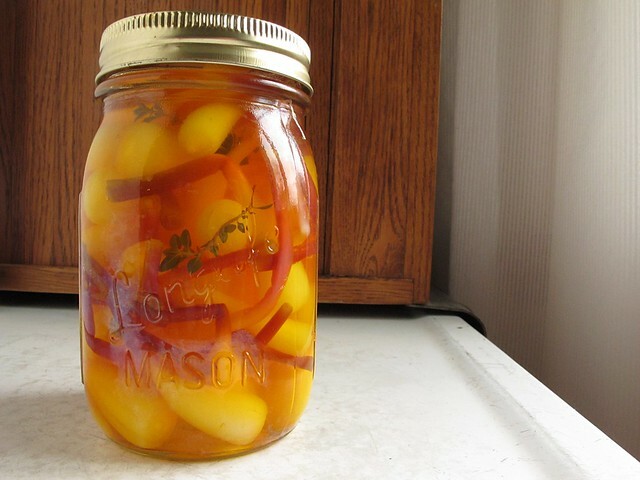 There are lots of nice looking ramp pickles out there, but I figured that if I am going to can a single jar of something, I had better make it stellar - and what does that more than saffron. I had just enough left (I had this high-quality one from the Spice House) for a half recipe. The saffron transformed plain, white vinegar (the stuff I call "household vinegar" since I generally use it for cleaning) into something truly amazing. It's golden and sunny, and I'm going to try and save this one jar for a special occasion after it cures at least two weeks as Hank advises. If I was going to use the last of the saffron on something, this was definitely a good bet. I had trimmed down the ramp "necks" and saved the inch and a half or so sized pieces and let them simmer in the small amount of vinegar solution that was left after packing my jar and getting it into the water bath. I'll happily be munching them with something before too long! With the ramp bulbs snug in their jar, I turned the 6 oz. or so of ramp greens into this kimchi from the Hungry Tigress. All I can say is holy cow is this stuff good. You could easily polish it off before it ever got to fermenting, but most of it made it to the jar and it's sealed up on the counter for a few more hours before heading into the fridge. 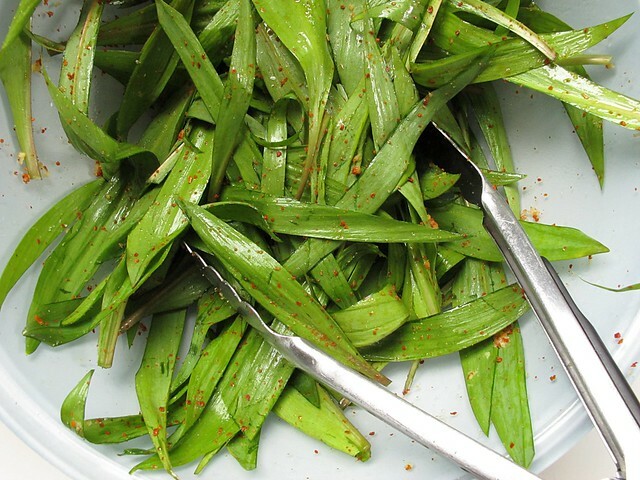 The only thing I could be sad about is how few ramp tops I appear to have now that they are fermenting and wilting... Now would also be a good time for me to mention that if you have ever seen a recipe on the Tigress site, make it because it will, no doubt, be great. Maybe I should make a verbal commitment to learn more about foraging and gleaning this year. OK, I WILL make a verbal commitment to learn more about it. Thinking of the great adventure I had with my little bounty today and what fun I've had in the past with similarly small hauls confirms that foraging is a good fit for me. I just need a few friends to start me on my way, since I am a little intrepid about just photo-identifying wild edibles. But I suppose for things like violets and now ramps, there really is no mistaking them. If you are lucky enough to spot some, forage mindfully and leave some to propagate for another day, and then... go make these things right away.